I’m still in the process of finding my bearings in our new town, exploring local shops and… the library! Our new library (see how proprietary I get?) is quite nice, although it has a mandatory fee for adults (it was free in Paris except if you wanted dvds). There are several self check-in / check-out machines on each floor (the kids love them!). The ground floor is for magazines, CDs and DVDs, crafts food and gardening, and art books (it feels like a huge Miscellaneous department). The first floor is for kids books, and the second floor is for adult fiction and non-fiction, and each floor has a huge selection of comics / graphic novels. I was lucky with the first pick I had from the adult graphic novels on display. 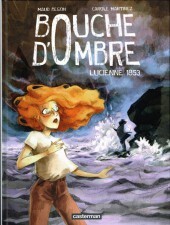 “La Bouche d’Ombre” (“the Shadow’s Mouth”, a quote from a Victory Hugo poem I didn’t know) is an ongoing series (3 tomes are already published but it’s not complete yet) and the story is just as fascinating as the art itself. 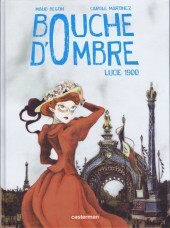 Even better, it’s a collaboration between a female writer (Carole Martinez, who got many literary awards) and a female graphic artist (Maud Begon, whose blog you can visit) and this is rare enough to be highlighted. 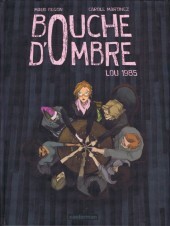 The first tome is set in 1985 and introduces us to Lou, a high-school junior in Paris with a large group of friends and a taste for partying and hanging out. A friend suggests a spiritualist séance to conjure up dead ghosts (because it seems fun and because they study Victor Hugo in school). The session goes only too well, and after a friend of hers commits suicide, deeply upset by the séance, Lou realizes that she can see dead people. This gift does not come kindly, and Lou struggles with what she feels and sees. There are many family secrets, and it seems that supernatural gifts have been running at various degrees in Lou’s family. Hypnosis helps Lou make sense of it, and understand what the deads want from her. The second volume, titled Lucie 1900, focuses on the complex relations between science and the occult. The present and the past intersect under Lou’s eyes and in her dreams. We still see Lou in 1985, but when she gets obsessed with a young woman without a face, a woman named Lucie who lives at the beginning of the 20th century, a second timeline opens in the novel. The year is 1900 in Paris, when a huge international exhibition was held that showed the latest in science and art innovations. Lucie is enthusiastic about science, she gets acquainted with famous scientists Pierre and Marie Curie, but she also has a secret that is both overpowering and terrifying, and that threatens the rationals of science. Lucie is actually Lou’s grandmother! The end comes back to the present day with a shocking twist that will send the reader reeling. In the third volume, titled Lucienne 1853, we leave science for literature. Lou still presents the contemporary framing of the story. She is devastated by the events at the end of the previous volume, but she now understand enough of her gift to decide to travel back in history to try to rectify the situation (ouch, it’s tough to avoid spoilers!). We visit Jersey island at the time when Victor Hugo and his family were in exile there. Victor Hugo is obsessed with the occult and the spiritualist movement, hoping to get in touch with his deceased daughter Leopoldine. But a mischievous, red-headed little girl-spirit messes with them. There are so many interesting layers in this story. The art is quite atmospheric, at times romantic and scary. It is never static and conveys a deep sense of mystery. It’s girly without being one bit hokey. I can’t wait for the final volume! I buy graphic novels for my god children but don’t read them myself. I should do something about that, but I’m afraid these wouldn’t do as my French is non-existent. I know that not everybody will have access to this series, but perhaps (hopefully?) it will be translated into English one day? I see you take an appreciation in French graphic novels. I may check these books out. Might I recommend the French graphic novel The Rabbi’s Cat by Joann Sfar, if you have not already read it. I know of it, but Joann Sfar’s art is not my visual cup of tea (is that a concept?). This graphic novel has been a huge publishing success.